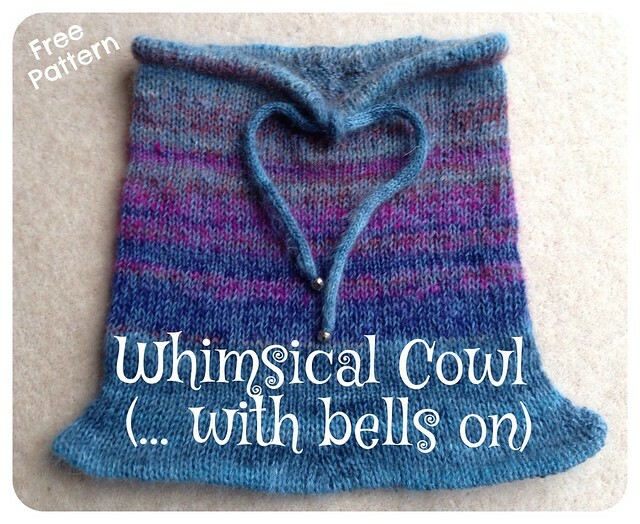 For those who have asked for more details on my Whimsical Cowl, I've written up the pattern so you can make one too. The cowl is knit from the top down in the round, with an icord drawstring held in an integrated placket, and shaping at the bottom. 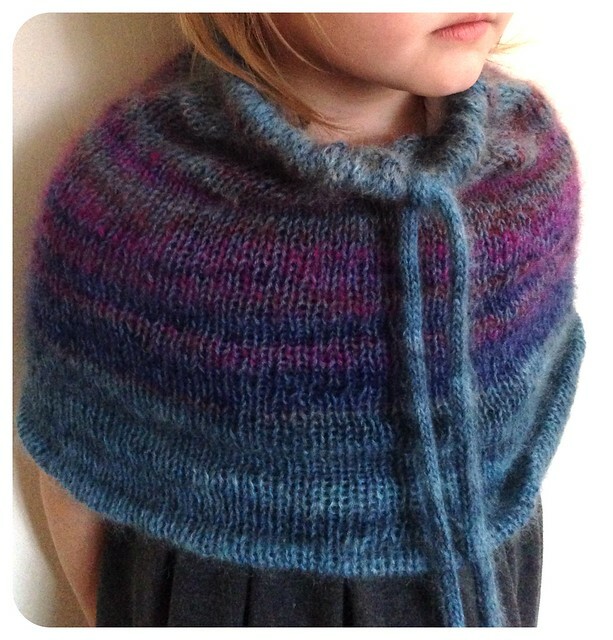 These features mean that it sits nicely around an adult neck and it can also be used as a child's capelet, or as a child's hood (I love versatile garments). 1. With the 6mm circular needle and crochet hook, cast on 96 sts using a provisional cast on. 2. Knit flat (back and forth) in St st for 4 cm, ending with a WS row. 3. Join to knit in the round, place a marker, then knit 2 rounds. 4. With RS facing out, fold the work in half so that the live stitches and provisional cast on are next to each other. Release the first cast on st and put it on the needle, then knit it together with the first of the live sts already on the needle. Repeat across the whole round to create the placket which will hold the icord. 5. Knit in the round until the work measures 30 cms. 6. Kfb, k23, PM, kfb, k23, PM, kfb, k23, PM, kfb, knit to end. 7. Knit 10 more rounds with a kfb after the markers on each alternate row. 8. Bind off loosely, leaving enough yarn to sew the hem. 9. Fold the bottom edge up (WS together) so that there is a hem of approx 1cm and sew to hold in place. Because of the increased stitches, this will leave a slightly wavey bottom edge which looks especially nice when worn as a capelet. - Using DPNs cast on 4 sts, if you'll be adding bells, leave a long tail for sewing. - Knit the icord for 100 cm (or to desired length if you have plenty of yarn). - Bind off leaving the tail for sewing up. 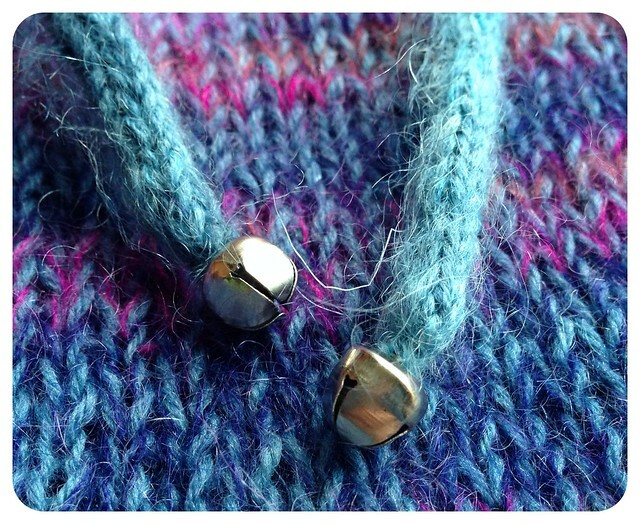 - Thread the icord through the placket and sew a bell onto each end. - Sew a couple of stitches between each end of the icord to give the open section of the placket a nicer finish. I'm really enjoying wearing mine and hope you will too. Any questions, please let me know. 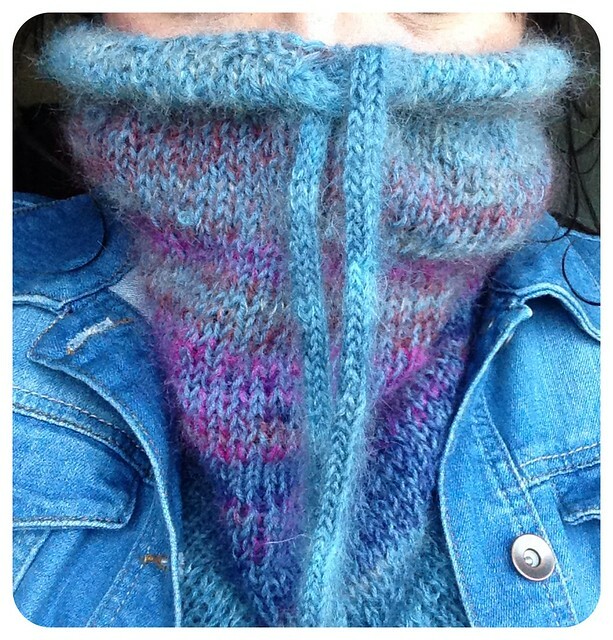 If you make it and use Ravelry, please link your project to the pattern notes so I can see how it turned out! *For the sample, some rounds were knit with a smaller needle (4mm), but it doesn't show very much with this self-striping yarn. It's nice how it can keep anyone warm. Adorable ... and the bells are an especially nice touch! That's so cool! Thanks for sharing and I'm definitely going to try and make it!